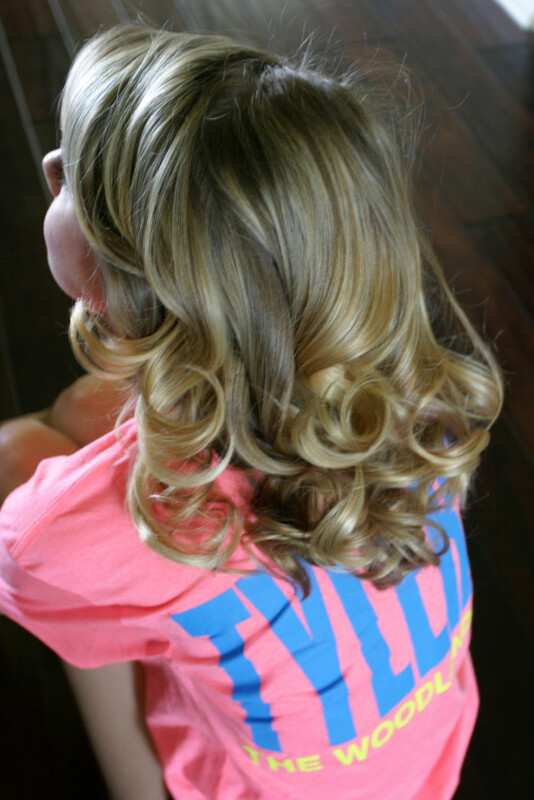 This is one of my favorite hair looks for summer or competitions! It's a cute way to keep hair out of your face, which is good because sweaty/greasy hair in your face can cause breakouts. (If that happens, click here to read my Top 10 Do's And Don'ts For Good Skin.) Here's a step-by-step braided messy bun tutorial so you can learn how to recreate this look for yourself. 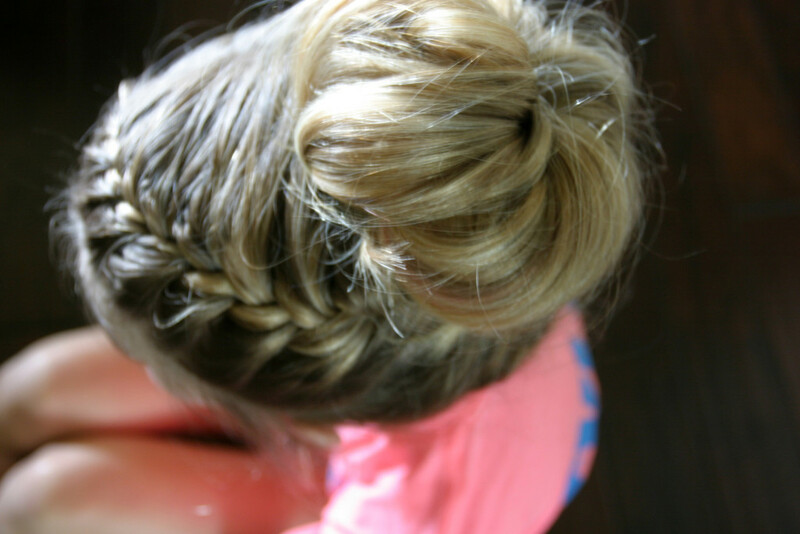 French braid + messy bun = perfect summer hair. 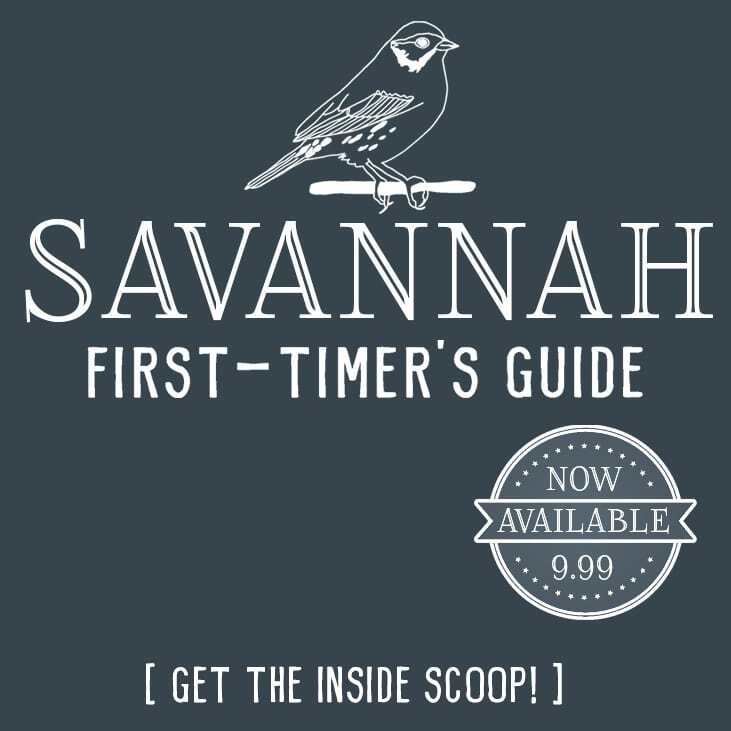 It's great for cheer or dance competitions! You can create this look with clean hair or 2nd day hair. It may be a little easier with 2nd day hair because the braids won't be as slippery and will hold better. When I create this look on clean hair, I use Frederic Fekkai Full Blown Volume Styling Whip to give my hair volume and extra holding power. My hair starting out…it's clean — with a little mousse added — and has bouncy, loose curls. 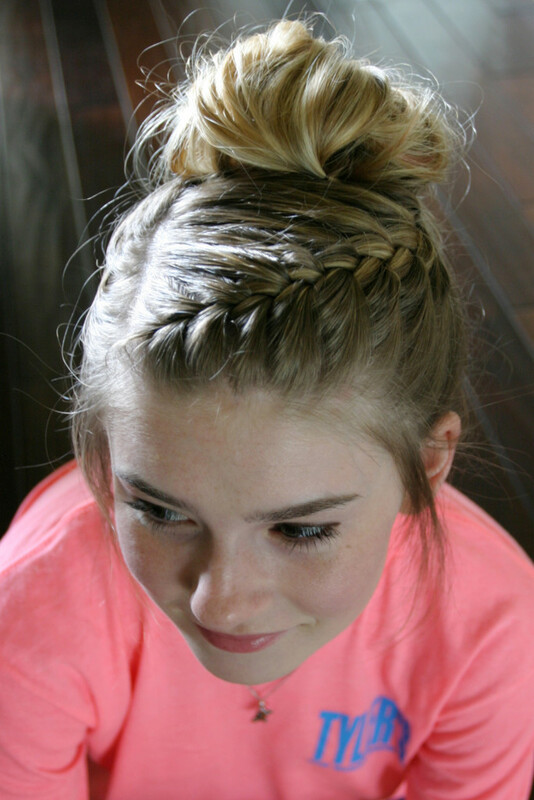 Step 2: Part your bangs on the side where you typically part them, then add a french braid that begins at your bangs and goes down to about ear level. 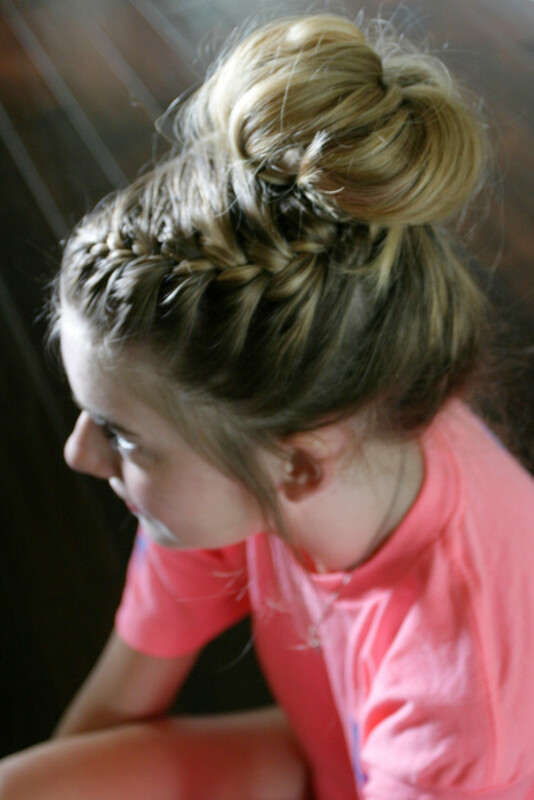 Finish it off with a regular braid, and add a small clippie for easy removal for when it goes in a messy bun in the next step. My french braid morphs into a regular braid just above my ear. Step 3: Remove the clippie and use your fingers to pull the remaining hair into a bun. Pin any flyaway hair with bobbie pins. It also helps if you use a little bit of hair serum to tame the loose strands. I pull the hair kinda loose in the messy bun so the bun will look more voluminous. TIP: Your hair probably needs to be shoulder length or longer to have a high bun like mine is in these pics. 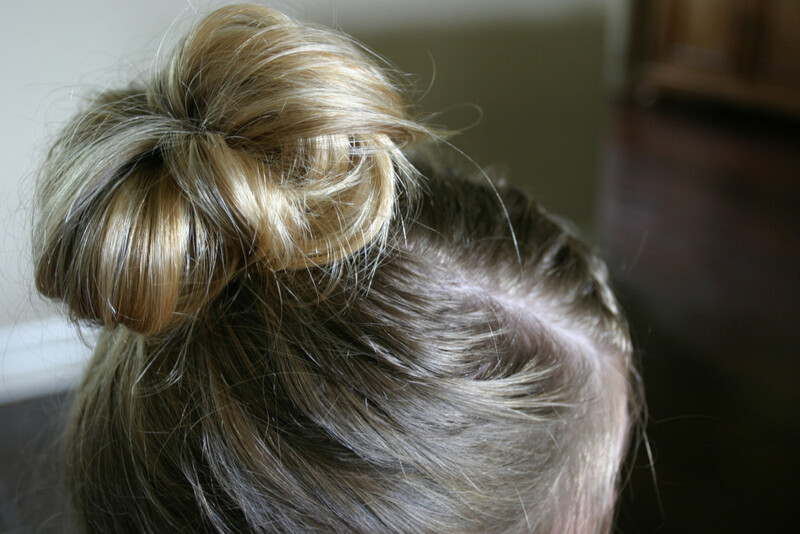 If your hair is shorter, just arrange the bun lower on the back of your head. Voila!! 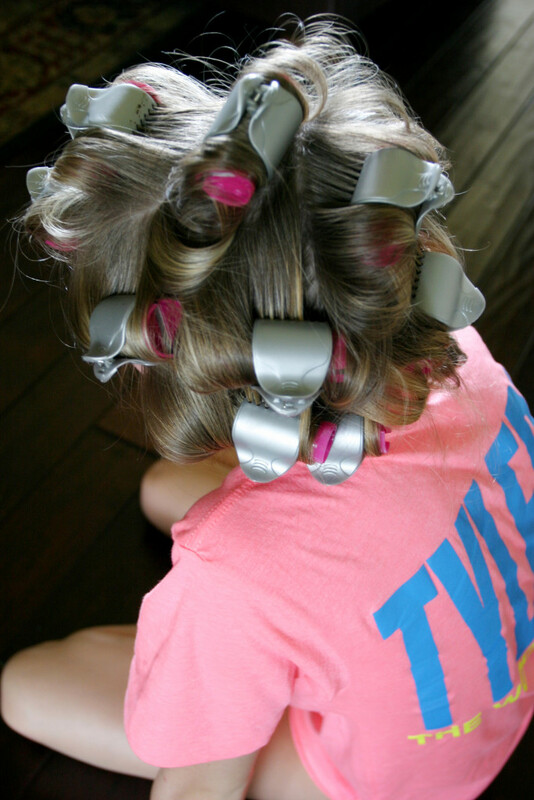 This is a fun and easy look for summer hair! The hair conditioner I've been using lately to keep my hair in tip-top condition is called Shea Moisture Manuka Honey Hair Masque from Target. It only costs around $10 and it smells sooooo yummy! 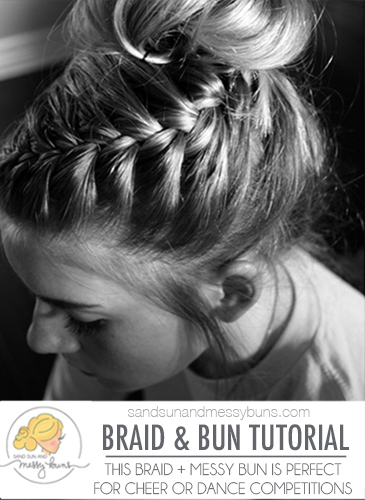 Let me know if you have any questions about my braid tutorial! You might want to also check out my tips for long, loose curls or this messy side fishtail braid while you're here. I love this style. I might try this, looks a little tricky. Thanks for sharing. all of your hair tutorials make me miss my long hair so much!! i LIVED in a messy bun, and now i can barely get a bun in. back to growing it out!